Nursery rhymes are amazing for young children. It may drive you crazy to repeat Humpty Dumpty 10 times a day, but your child is cognitively growing by leaps and bounds! Did you know that nursery rhymes have beens shown to improve reading, spelling, and other literacy skills? 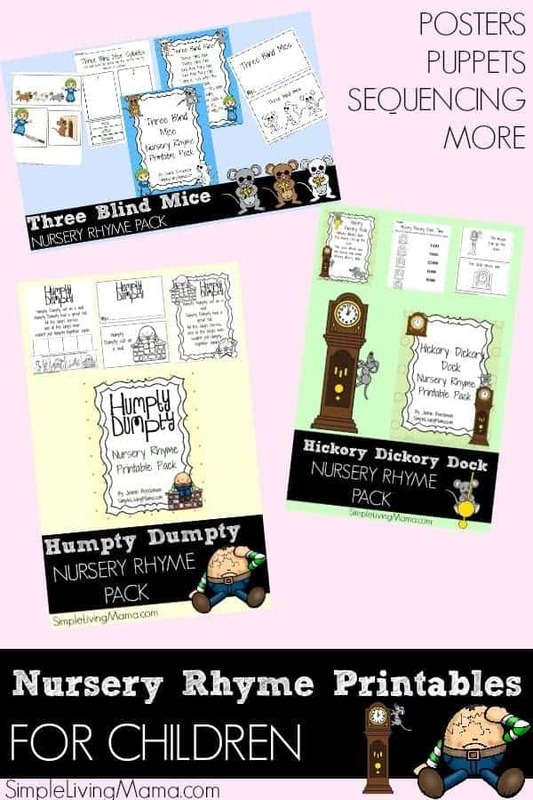 I have created these nursery rhyme printables to be used during our morning time, as well as to give my preschool children some activities to do while I’m homeschooling the older kids. 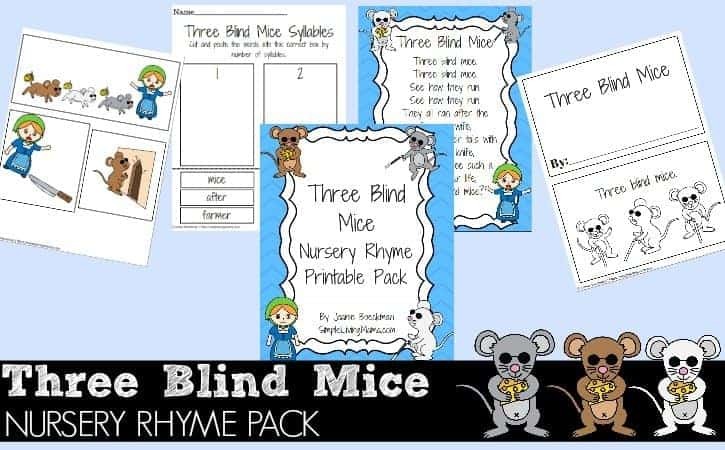 The Three Blind Mice Nursery Rhyme Pack includes nursery rhyme printable coloring pages, as well as a coloring book, nursery rhyme puppets, sequencing pages, and more. 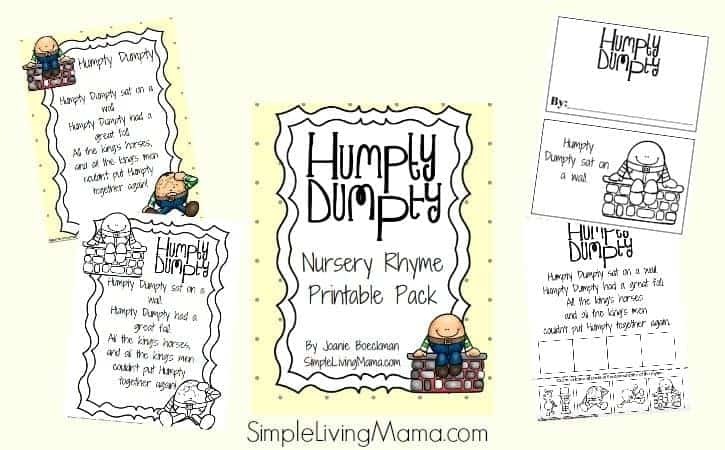 The Humpty Dumpty Nursery Rhyme Printable Pack has a nursery rhyme coloring printable, a nursery rhymes sequencing page, printable puppets for story retelling, and more activities! 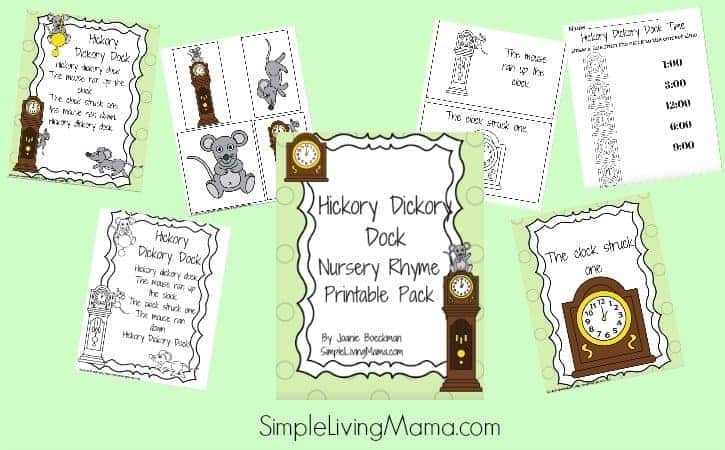 The Hickory Dickory Dock Nursery Rhyme Printable Pack helps your child tell time to the hour, includes nursery rhyme coloring pages, a nursery rhyme color and cut book, as well as nursery rhyme sequencing and printable puppets. We have had a lot of fun incorporating nursery rhymes into our morning time. Even my two year old looks forward to singing the nursery rhymes with us!